A, B and C models, 1939-1954 Farmall Tractors. 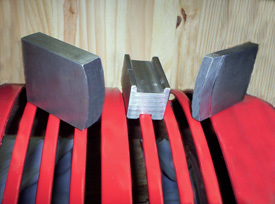 Three piece grille reforming tool set. Repairs horizontal bars of grilles to original factory shape. Die also acts as a gauge for correct spacing between bars. Precision tools are model specific, made of steel and used with a hammer. The die and two curved punches have working surfaces of 3".